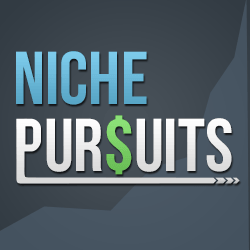 Welcome to another episode of the Niche Pursuits podcast! Today Perrin and I are excited to bring you the income reports for the authority site and my amazon product. We also discuss a pivot I am making in my business based on these numbers. The details of these income reports can be found in this blog post from last week. Last month our authority site brought in $912.70, mostly from Kindle books, and some Adsense revenue. We did grow from 625 to 1300 email subscribers which is excellent. However, at this point we’re facing a bit of a reality check: we’re now 10 months in to this project, and the traffic is not growing like we had hoped. Currently we’re spending $3,000-4,000 per month on content creation and marketing. Over the past several months we’ve spent $15,000-20,000 and only realized $7,000 revenue. On the other hand, my Amazon product launched March 28 and saw revenues of $4,400 in the first 30 days. This started as a very casual side project, but we sold out of the first batch of 105 units in 40 days for an initial revenue of $6,000. Looking forward we’re planning to increase profit margins through lower freight costs and lower price per unit due to economies of scale with our manufacturer. The difference in momentum between these two projects is allowing for a pretty clear decision in our business focus. As of today we will be putting the authority site on hold and try to make it more passive. We will finish a book we have in the works, and continue to operate the site, but we won’t be putting many more resources into building it out. At this point, we will be focusing almost entirely on growing the Amazon physical products business. This will allow us to scale this into what could be a very big business. I can see a portfolio of Amazon products doing millions of dollar per year (potentially). To do this we will be creating a portfolio of products and creating a website for these products that we plan to grow. The same lessons we learned in building niche sites will continue to apply to these Amazon products and related sites: keyword research, content creation, and paid acquisition. One important take away that Perrin and I have been thinking about is the importance of having your own products to scale a business. This is something I learned with LongTailPro, and continue to reinforce in my business now through Amazon FBA. If you’re enjoying the show and would like to show your appreciation for the Niche Pursuits podcast in general, please leave a rating on iTunes right here. As always, I would love to hear any feedback in the comment below. Thanks! Hey Eric, I don’t want to share the company name. The ocean freight depends on the amount of your order. The additional fees for pick up, customs clearance and everything will probably be more than twice as much as the actual ocean freight. So, if ocean freight is $400, there will be at least another $400 in other fees. Hope that helps. I simply don’t want the company to be bombarded with orders. I am having my own product moved from China, so I want to make sure they are responsive and effective for me. Adding tons of new customers might affect their performance for my stuff. Spencer, all due respect someone was cool enoughf to share that freight forwarding company with you. You are now benefiting from that reccomendation. Pay it forward. You come across as a sincere guy, go all the way shoot us some service providers as well. They are obviously an experienced company with big boy pants and can handle the business. Make it worth your wild. The least you can do is ask them to discount your personel shipments relative to the number of refferals that you send with a customer code that refferences you as the refferee. Usually I would. However, the one stipulation that Chris gave me when he referred me to this company is that I would not share the company publicly on my blog. His reasons are the exact same that I just gave above. In order to honor that request, I won’t be revealing. However, if you google, “freight forwarding company”, “logistics from china”, “customs agent”, “how to ship product from china”, or something similar…you will see lots of natural results and ads for companies that are qualified to do the job. I don’t think finding a logistics company is that big of a hurdle. Not about being a hurdle Spencer…just would have been a time saver to use a tried and tested service provider who will do exactly what I need. Im sure you know where im coming from. its all good though. I’m not familiar with inventory lab or keepa box. I’ve also started moving slightly away from affiliate niche sites and the “passive model”. Although I’m still monetizing affiliate sites, I found that I was making more money by offering SEO to other businesses, so I started focusing on that instead. I find the Amazon FBA idea interesting, but don’t know if I have time for that as well. How much time do you think your putting in to build that business? The time I am putting in is research manufacturers, ordering samples, market research, etc. I’ve been spending a couple hours a day for the last week or 2. I expect I’ll be spending less once I’m actually decided and selling my next couple of products. On my end, I’m building a site in the market we’re in to help drive traffic to our products and build a brand, which will probably be a bit more time-intensive than the FBA site after Spencer has the new products up. That said, having a website is not necessary to sell products on Amazon; we just think it’s a smart, long-term play that can both boost and protect the business as well as open other doors down the road. I had to jump on here after just listening to the podcast. I am so super excited you’re now moving towards talking about FBA, and I’ll tell you why: Several months ago, I stopped listening to you, Pat Flynn, and other Internet marketers because I just did not want to put in all the time and effort that was required to build authority sites. It was so time-consuming and I just felt like you have to put in all this time and money with no real assurance that it would pay off. Strangely, without even knowing that FBA had already become popular, I felt the need to look into how to sell physical products, so I remembered Pat Flynn had previously interviewed some big-time Amazon sellers (SPI 127 & 144). I’m excited to tell you that after learning online for free about this business (mostly thru Ryan Moran and ESPECIALLY from Scott’s “The Amazing Seller Podcast”) for the past couple months, I JUST placed my first private label order from China 3 hours ago! I honestly feel that YOU, my friend, are in a position to bring a lot of value to this community as you get going yourself, because not only do we all know you’re smart go-getter, but the fact that you have other businesses already puts you in a better position then probably most of us, as you have the cash flow to get ahead a little quicker than alot of us, so I can’t wait for your updates!! Angel, THANK YOU!! I honestly almost didn’t release this podcast because after I listened to it, I thought I sounded too excited and perhaps over the top. So, getting a comment like yours to let me know that you really appreciated the podcast and the shift in my business is great to hear! That’s awesome that you just placed your first order…good luck! I’ve received several samples of products this week from China, and I expect to make some decisions by the end of the week for what products I’ll be ordering to sell on Amazon. thank you so much for sharing your progress. Whenever I listen to your fantastic insights I feel like I’m always two steps behind. Last year I stopped experimenting with a RFID shield for passports which I sold via FBA. I sold maybe a thousand units and made some nice money on the side, but the margin for my product was too low. And I also ran into issues regarding legal protection of registered designs when I tried to have my own products manufactured. How do you avoid utility patents? Therefore I went back expanding two of my niche web sites into authority sites. As you mentioned these sites take much longer to gain traction, nowadays. I’m publishing highest quality articles on a weekly basis, still the growth is very slow. Anyways, because of some fantastic tips from you guys I published my first e-book recently. I’m testing to grow my e-mail-list for my podcast dj mixshow this way. Thanks for the kind words Thorsten! I haven’t run into any issues with utility patents. Sounds like you are putting in some great effort in your business, something will “click” eventually. Best of luck! I ask you in last post about comparison on the net to net profit from the both business and I am completely agree with your decision after your explanation that you are investing so much money plus time in the authority site. There is no hesitation for me to go with FBA and minimizing efforts on authority sites when see myself at your position. But there are few questions I come up in my mind after your last post. As I am beginner in Authority project and kindle publishing. Also there will be many of them with the same level as I am. My question is that as a beginner with very less budget I don’t have a chance to start a FBA business which took around 3.5k for you in your first investment, should I keep working on authority project which is long time investment? Kindle publishing looks very exciting should I carry on with it? Do you still suggest to keep going with Authority site & kindle publishing for beginners? Would be great to know your take on this Spencer. My best wishes with you for the FBA business. Thanks for sharing your experiences with us. I think people need to figure out what works best for their individual situation. If you have no money to invest, then you are indeed limited in what you can do. There is nothing wrong with pursuing website building and kindle books. Thanks Spencer for the clarification. Keep that motivation flows to everyone. Hi guys, I totaly understand why you are diving into FBA right now, after all , you rubbed a little on the surface and it’s shining so overwhelming that you’re probably considering sunglasses to cut the glare out. however, as shiny as it may seem now, things can look very different a few months from now and if anybody knows that than its Spencer…. I know you are winding down on the authority site but i’d appreciate it if in a future podcast you 2 would discuss what exactly has been done for that site in terms of seo,… Did the site “grew” in terms of the backlink profile and did google’s algorithm simply not respond? things like that…. Loved the podcast as always, in fact i’m always so happy when i see another one published that i’m dancing to the startup tune,…. really. Thanks for the kind words Higgins! We’ll keep you posted with future analysis for sure. Hi Spencer, let me thank you for your great site. This is my first day I discovered your site and reading is very inspirational. 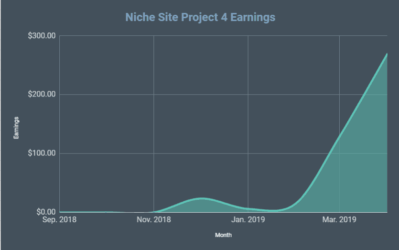 Let me just ask you – why do you only monetize your niche sites via adsense? For me, affiliate programs, especially financial ones, have much better RPM than adsense. Do you use affiliate monetization on some of your sites or not? Thanks John! I use multiple affiliate programs on my niche sites including Adsense, Media.net, Infolinks, Amazon associates, and other affiliate offers at times. Adsense tends to be used the most because it’s the easiest, has the broadest reach, and tends to pay very well in comparison to other options. What do you think that is the top 3 strategy for get reviews in your FBA product? 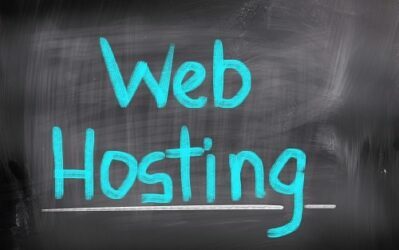 I would like to know what type of hosting plan are you using on the Authority site? How well is the site optimized for organic SEO in regards to factors other than keywords? I dont believe ive heard you mention this before, but did you get a upc code for your product. Did you get upc stickers placed on them before shipping to amazon? Yes, I got a UPC code. I had amazon put the UPC code stickers on for first batch. For the second batch, the manufacturer is including on my product packaging. Hey Spencer, I am curious could you share what is the Competitiveness of the niche of the current Authority site you were discussing ? I use Long Tail Pro Premium and just very curious as what is average KC more or less of that Niche ? KC is calculated based on single keywords; not entire niches. So, there isn’t just one number. Keep them comin’ Spencer and Perrin. 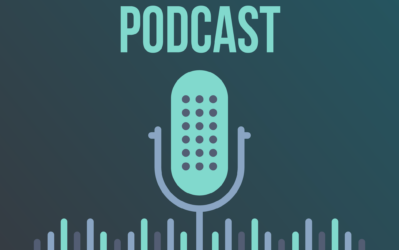 I only listen to a few podcasts and there is always something very authentic about your podcasts and they never sound cheesy like some other podcasts out there sometimes do. Just a thumbs up for your honesty. I have a question regarding SAMPLES. It’s always better if you could modify your product slightly to make it a tiny bit better, that’s something you’ve said a couple of times. When you ask for samples from manufacturers I suppose you would want the sample to be as close to the end product you woudld be seller as possible. So taking the pet carrying bag as an example, you would want to add a little padding, but suppose the manufacturer has to prepare this especially for you. Even if that is a very slight modification I can only assume that the manufacturer would not be willing to do it for 1 sample or not even for 30 or 50 quantity. Any idea on how this could be addressed? Thanks Ed for the kind words about the podcast! In some cases, it could be expensive to get samples of the unique product. In my case, the manufacturer already created exactly what I wanted…it just wasn’t being sold on Amazon yet. I miss the days of learning about niche and authority sites for affiliate based programs. I hope that you’ll continue down that road since I won’t be joining the whole FBA fad. I’ve made decent money over the past few years working strictly affiliate based sites with no worry about inventory, suppliers, patents, shipping, etc. Please spend some time on these types of sites since it is the model I am following and will continue to follow for the foreseeable future. I’m sure I’ll continue discussing building websites/SEO. I am glad your shared your Amazon experience, I have on product listed on Amazon that is very slowly selling, hopefully with some additional reviews it will improve. I want to pick another product to sell on Amazon but I struggle with knowing how to pick good potential products. You have been great with providing detailed criteria and methods for selecting key-phrases for websites. I somewhat understand the importance of the product’s top level Amazon ranking, number of feedback on competitor’s products, score/quality of feedback of competitors but nothing specific. Would you mind sharing the criteria that you used to weed out bad products and come to what you believe is a good product to sell? Jon from Fat Stacks Blog. Thanks for the shout out at the end of the podcast. I’ve long considered adding physical product / ecommerce to my niche sites. It’s definitely a possibility and probably a smart move. That said, content alone is a product with display ads. 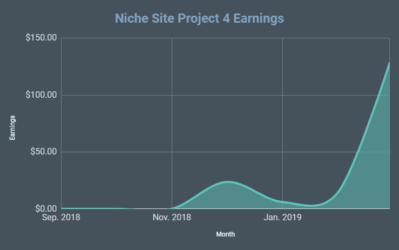 I’m working on a post that I’ll publish on Fat Stacks where I crunched my numbers from Google search traffic only (for my biggest B2C niche site) and noticed that across all posts, I earn $184 per year per piece of content from Google search traffic only. Each piece of content on average costs $90. Moreover 9% of my posts generate 76% of my revenue (i.e. revenue from organic search traffic). That’s a decent ROI just from organic search traffic. Now, I’m working on doubling the ROI over the next 6 to 12 months with hundreds of new posts that really go after a lot of long tail keywords similar to the keywords that are currently working really well. It’s a big push, but it’s easily outsourced and it’s search traffic, which means margins are really high (less the cost for content). FYI, I’ve done no backlinking – it’s just social media and a lot of content. Like Perrin said, I also buy a lot of traffic which I believe really helped jumpstart organic traffic growth. It works, but buying traffic only makes sense for specific types of posts. It’s a bit trial and error, but once you figure it out, getting to 1 million monthly page views doesn’t take long. Anyway guys, I’ll be back to learn more about the Amazon product biz. Looks like it’s going to work well for you. Love those stats. We’re going to be trying some of your tactics with our new site that we’re building around our Amazon FBA product. Hopefully, with our own product in the mix, we can jump the revenue per post WAY up. I also agree with what you said about adding hundreds of new posts targeting long-tail keywords. I’ve been telling people this for a long time: one of the best ways to scale any site is just to ad a bunch more content. Earning $184 per post and want an $18,000 raise? Add 100 posts. Thanks for sharing some of your numbers! Very cool that you are seeing such great results from just social media and content..no official link building. Very interesting podcast, I would have a question. For Amazon FBA do you do it under a US company or a HK one? Is it possible to do FBA with a HK company? I have a US company. By “HK” do you mean Hong Kong? I don’t know. This is very informaitve article and very inspiration. Thanks for sharing. I want to know that for affiliate marketing whether our website rank matters or not. First of all, I just wanted to say I’ve been reading your blog for about 9 months now and I love the format, clarity etc. So I’ve heard your FBA podcast and I’ve spent the past couple of weeks looking through Amazon’s best sellers list…and I’ve had little luck. I came across a product which I thought may be a winner, only to find that once I factored in all associated costs and taxes I’d be left with something like a 10% profit margin. So sure, 10% is better than nothing, but I wouldn’t know what the customer returns rate is like until I had the product running for a good couple of months. 2) How do you go about finding products? I’ve literally been clicking on product categories until I’ve got down to the furthest sub-category, and looking for products which are upwards of £20. However, I feel as if this approach isn’t the most time-effective to take and it hasn’t got me anywhere. Are you using any tools? Lastly, you mentioned that you think it’s really important to be selling a customised product i.e. 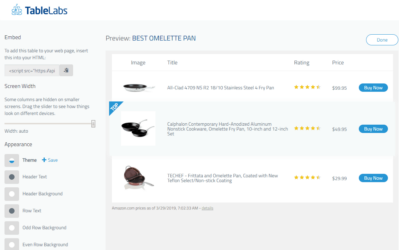 you’ve modified it some how after taking into consideration user reviews for the product you’ve selected. From my experience so far, the minimum order quantities that China are looking for in order to modify an existing product which they manufacture means an initial order has to be quite large. How do you approach this issue when placing an initial test order? 2. I’ve only found 1 product really. It was just a personal need…didn’t use any tools. Re: customized products. I should clarify that the product I’ve done is NOT new to the manufacturer…they already created it exactly how I wanted it before I came along. However, this exact product is NOT on amazon already. So, I’m essentially the only one selling this product with a particular feature. That’s how I’m different. As a result, I could order very low quantities. Hey guys, I noticed Amazon requires there to be a choking warning on the poly bag of an item over a certian size. My manufacturs poly bags dont have any types of warning. What will happen if I ship it to FBA without this warning? Im guessing you didnt come across this problem because you used custom packaging. Also, what type of info should I be looking for when searching for a freight forwarding service. Is their some key points I need to pay attention to? I haven’t come across that. As for freight forwarding, I would just look for a company that looks like they’ve been around for a while and knows what they are doing. Hey guys, I got to about the 14 minute mark and decided to drop a comment and then Perrin basically touched on the point I was going to make which is that with your authority site project, without knowing the domain and specifics, you clearly went down the path of building a massive resource (a true “authority site”) from the get go. If you look at two Authority Sites we are all familiar with: SmartPassiveIncome.com and NichePursuits.com, those are two examples of authority sites. They both didn’t start with a rush of tons of content, creating ebooks right away and pouring 20+ hours per week into them for the sake of making it an authority. They became authority sites and once they were proven businesses in their own right, or once yourself and Pat saw the potential, that’s the point where they warranted more time investment. I believe an authority site is something that happens, as opposed to something that you build. You kick it off really as an MVP model so that you don’t get to a situation like where you guys are feeling like you’ve not got sufficient return on your time invested > Baseline content, baseline link building, baseline non-Google traffic generation. 8-10 hours per week and you scale it up once it’s got some momentum. You guys went far more aggressive and so 10 months down the track there’s been a ton of time (and money) invested in the project for minimal return. Though I would argue that 200-300 per day, tons of content, likely returning visitors, an email list and some new experience creating and selling ebooks is a pretty significant return. Presumably you could scale the hours on it back by 70% and still make pretty similar income to what you’ve been making now because the foundation has been laid. In which case the ongoing ROI will be decent. You’ve probably learned the lesson of perhaps not pouring too many hours into an un-proven asset, but you’ve also got a fantastic foundation to now launch from without spending so much ongoing time on it. So I’d still be calling it a win. Nice work on the pet site featured on Backlinko a few weeks back too perrin. Super effort. We are definitely going to scale back the hours spend on the authority site, but not giving up on it completely. We actually have a nice asset that bring in email subscribers and we still sell books. Between the new email subscribers and if we continue to write a few more books (which is highly probable), I think the next year of two could actually be quite good for the site. It will just continue to be a “side” project, rather than a “primary” project for now. Very inspirational, Spencer, particularly the insane email subscriber growth. It speaks volumes as to the importance of list (and relationship) building. Last week Google banned my Adsense account 🙁 Now i will go with Affiliate !! Thank you for the podcast, it was awesome! When listening to your podcast you mentioned about how you were spending too much money on the shipping for your fist order from China. What are you going to do different with the shipping? I mean how can you safe money for future orders? My first batch I shipped via air; I will be shipping via ocean freight from now on. I went by air just to quickly test things; knew I wouldn’t make money. Ocean is significantly less in cost. When you make changes to a product … are you worried about patent infringement? I have this great idea but i’ll bet someone has a patient on it … have you looked into that? If you are concerned that someone might have a patent on your idea, you should definitely look into it. Thanks for creating and maintaining such an honest podcast. I really enjoy following you on your journey here. Too bad you had to leave your authority site. But taking action on the feedback you got, sounds like being the right action to take. Thanks Esben! We haven’t completely given up on the authority site, but its a secondary focus now for sure.